Gasoline-powered RAV4 models will arrive at dealerships in December while Hybrid variants will arrive in Spring 2019. Topline: The 2019 Toyota RAV4 gasoline models will be available in five grades (LE, XLE, XLE Premium, Adventure, and Limited) while the hybrid models will be available in four grades (LE HV, XLE HV, XSE HV, and Limited HV). 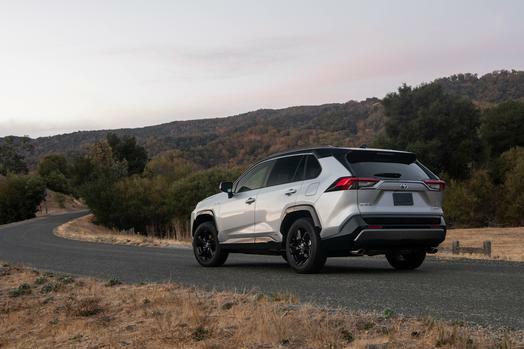 What's New: The leader and creator of the compact SUV segment in the U.S. is all new for 2019 and is based on the Toyota New Global Architecture (TNGA-K) platform. Like the Avalon, Camry, and thee 2020 Corolla, the TNGA platform provides the RAV4 with a robust foundation for improved driving dynamics, comfort, and safety. Compared to its predecessor, the new RAV4 is 1.2-inches longer and the wheelbase measures in at 105.9-inches. The stretching of the wheelbase has helped in improving the legroom for the rear seat occupants. Bumper to bumper, the overall length of the RAV4 comes in at 180.9-inches or 181.5-inches for the Adventure grade model. On the LE and XLE grades, the height of the RAV4 is reduced to 67.0-inches with the antenna. On the XLE Premium and Limited grades, the overall height is measured in at 67.2-inches. However, the Adventure grade is the tallest of the bunch with a height of 68.6-inches. The width on the Adventure grade RAV4 is 73.4-inches while the rest of the grades measure in at 73.0-inches. Depending on the wheel choice, models equipped with either 17 or 18-inch wheels, the front track measures in at 63.0-inches and it decreases to 62.6-inches when equipped with 19-inch wheels. Likewise, when equipped with either 17 or 18-inch wheels, the rear track measures in at 63.7-inches and decreases to 63.2-inches when equipped with 19-inch wheels. Besides the standard front-wheel-drive system, depending on the model and trim selection, Toyota offers the 2019 RAV4 with three types of all-wheel-drive systems. The LE and XLE grade offers a conventional all-wheel-drive system as an upgrade over the front-wheel-drive models. However, as an option on the Limited and standard on the Adventure grade, Toyota is offering a segment-first all-wheel-drive with torque vectoring with the ability to disconnect the rear axle at times when all-wheel-drive is not required. The third all-wheel-drive system is only available on all RAV4 hybrid models. While the gasoline engine powers the front wheels, an electric motor mounted to the rear axle powers the rear wheels. For optimal on and off-road performance and safety, the gas-powered RAV4 models with conventional or the torque-vectoring all-wheel-drive include Hill Start Assist Control and Trailer SWay Control. Downhill Assist Control is standard on Adventure and Limited AWD models only. 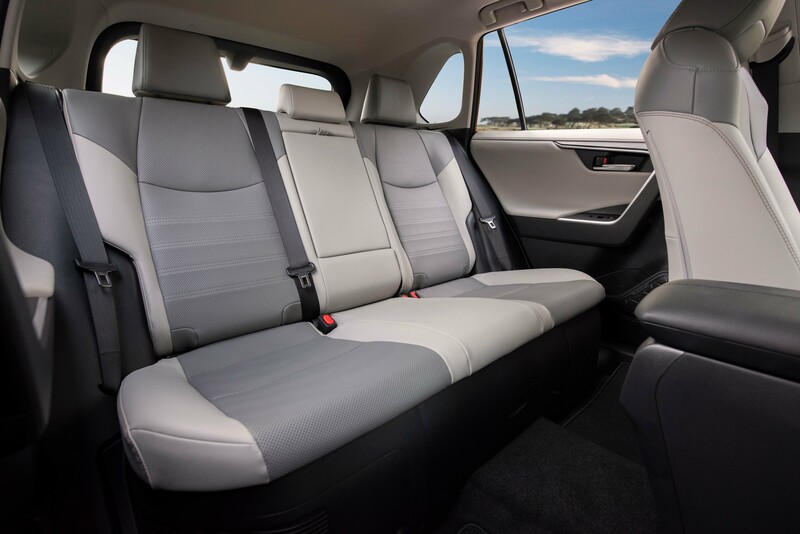 The interior of the 2019 RAV4 also has been redesigned to provide a more open and spacious environment with enhanced outward visibility for all occupants. When the occupants enter the cabin, they will be treated to a more refined interior design with more premium surface materials. For the first time, rear seat passengers in the RAV4 LE HV and higher hybrid models, and XLE and higher gas models will be presented with standard air conditioning vents. When it comes to multimedia infotainment, all 2019 Toyota RAV4 models come standard with Entune 3.0, which includes Wi-Fi connect powered by Verizon and is compatible with Amazon Alexa, Google Assistant, and Apple Carplay. For easy access, the standard Entune 3.0 uses a 7-inch touchscreen located on top of the center stack. Upgrading to Entune 3.0 Audio Plus adds an 8-inch touchscreen and SiriusXM radio. Further upgrading to Entune 3.0 Audio Premium adds dynamic navigation to the multimedia system. The optional JBL audio system adds eleven speakers in nine locations and has a combined output of 800-watts. What You Need To Know: The 2019 Toyota RAV4 is available with two engine and transmission choices. The gasoline-only models are powered by a new Direct Force 2.5-liter inline four-cylinder engine which produces 203 horsepower and 184 pound-feet of torque. The engine is mated to a new eight-speed automatic transmission. In the hybrid models, the 2.5-liter engine is assisted with an electric motor on the rear axle. The combined system output is 219 horsepower. 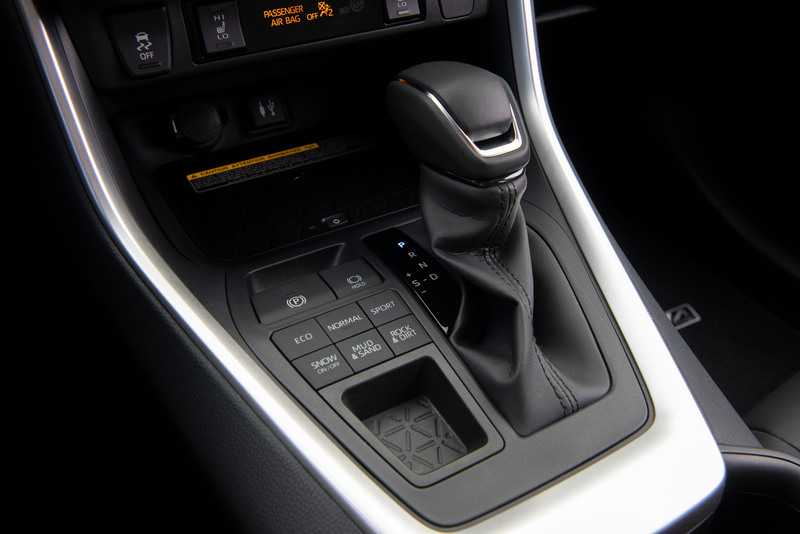 The hybrid powertrain is backed by an electronically controlled continuously variable transmission. The EPA estimates that the fuel efficiency of the 2019 Toyota RAV4 LE and Limited-FWD is 26/34/29 (city, highway, combined). LE-AWD is rated at 26/33/29. XLE and XLE Premium-FWD are rated at 26/33/29. Adventure grade and Limited-AWD are rated at 24/32/27. 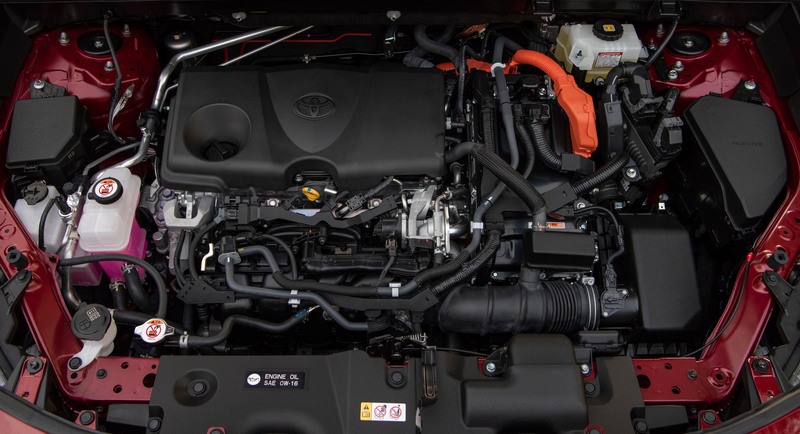 However, all grades of the RAV4 hybrid are rated at 41/37/39. Depending on the trim grade chosen, here is a list of features that are standard in the particular trim. The volume leader RAV4 LE comes standard with Multi-LED headlights and taillights, dual exhaust tips, color-keyed exterior door handles, low-profile roof rails, privacy glass, 4.2-inch Multi-Information Display, power windows with automatic up/down and pinch protection on all doors, soft-touch dash and armrests, a 12volt auxiliary power outlet in the instrument panel storage tray and a second one in the second row, front reading lights, and cargo area light. The RAV4 XLE grade adds 17-inch alloy wheels, Multi-LED headlights with chrome bezels and auto on/off headlamps, fog lights, color-keyed heated power exterior mirrors with LED turn signals and blind spot warning indicators, power tilt/slide moonroof with one-touch open/close wind deflector, dual-zone automatic climate control with rear air vents, Smart Key System on the front doors and liftgate with push-button start, remote keyless entry and remote illuminated entry, rear cargo area cover, and four additional USB charging ports. The new for 2019 XLE Premium grade adds 19-inch chrome finish alloy wheels, SofTex-trimmed seats with 8-way power driver seat and 2-way lumbar support, power liftgate, leather steering wheel, and shift handle with a sequential mode. The RAV4 Adventure grade comes standard with 19-inch wheels wrapped in 235/55R19 tires and active grille shutters. Optional features consist of heated and ventilated front seats, black or grade-exclusive mocha-colored SofTex seating surface, and orange stitching accents throughout the interior. When it comes to exterior color combinations, the RAV4 Adventure grade is available with Ice Edge-colored roof, which is paired with either Midnight Black Metallic, Blue Flame, and Lunar Rock. The RAV4 hybrid exclusive XSE HV grade comes standard with a sport-tuned suspension, aggressively tuned springs and shock absorbers, and black 18-inch five-spoke alloy wheels with 225/60R18 tires. The XSE HV also incudes piano-black accents on the front end, mirror caps, fender arches, and lower rockers. Projector-beam LED headlamps are also exclusive on this trim. When it comes to exterior paint combinations, the standard black roof on the XSE HV is paired with Blizzard Pearl, Silver Sky Metallic, Magnetic Gray Metallic, or Blueprint. Inside, the cabin surface is covered in monotone black SofTex material with blue accents. 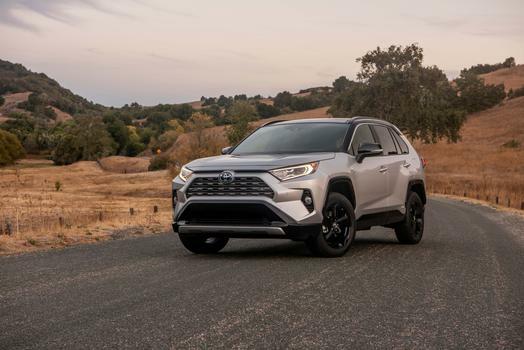 The 2019 Toyota RAV4 Limited grade comes standard with silver accents on the front and rear bumpers, large black-over fenders, Gray Metallic-colored grille, and 19-inch alloy wheels with chrome accents. Inside, a power moonroof, and 8-way power-adjustable driver's seat with memory and 2-way lumbar support are standard on the Limited. Optional features consist of heated and ventilated perforated front seats, heated perforated outer rear seats, and a panoramic sunroof. The 7-inch Multi-Information Display, power liftgate, Entune 3.0 Audio Premium with dynamic navigation with 8-inch touchscreen and six speakers, and digital rearview mirror are also standard on the RAV4 Limited grade. As with all new Toyota models based on the TNGA platform, the RAV4 comes standard with the second generation Toyota Safety Sense which includes features like Pre-Collision System with Pedestrian Detection, Full-Speed Range Dynamic Cruise Control, Lane Departure Alert with Steering Assist, Automatic High Beam, Lane Tracing Assist, and Road Sign Assist. Blindspot monitoring and Rear Cross Traffic Alert and Rar Cross Traffic Braking are standard on RAV4 XLE grade and above and is optional on the LE. Limited comes standard with Intelligent Clearance Sonar and is optional on XLE and higher grades. 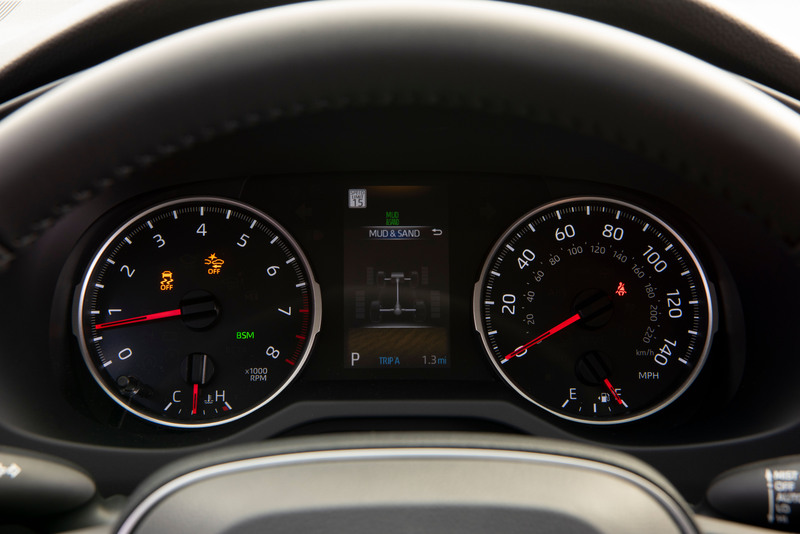 Regardless of the trim grade, all 2019 RAV4 models come standard with eight airbags, reverse camera with a projected path, and Toyota's Star Safety System, which consists of Enhanced Vehicle Stability Control, Traction Control, Electronic Brake-force Distribution, Brake Assist, Anti-Lock Braking System, and Smart Stop Technology. Panoramic backup camera with customizable dynamic grid lines and Bird's Eye View camera with perimeter scan, overhead 360-degree view, and curb view are optionally available on the RAV4 Limited. When the 2019 Toyota RAV4 gas models start arriving at dealerships next month, the LE-FWD will have an MSRP of $25,500. LE-AWD starts at $26,900 and LE HV starts at $27,700. XLE-FWD starts at $27,300, XLE-AWD starts at $28,700, and XLE HV starts at $30,900. Adventure grade starts at $32,900. XSE HV starts at $33,700. The 2019 Toyota RAV4 Limited-FWD starts at $33,500, Limited-AWD starts at $34,900 and the Limited HV starts at $35,700. The MSRP excludes the $1,045 delivery, processing, and handling fees.